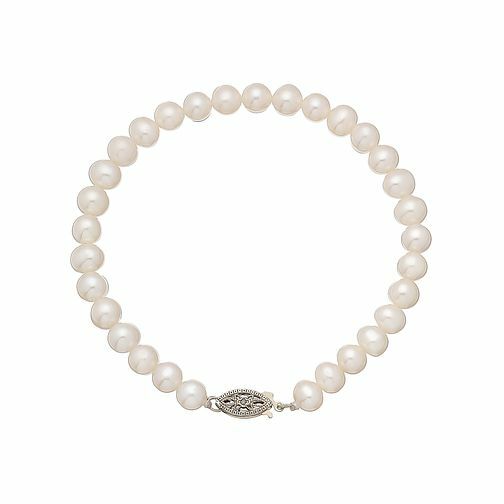 Certified by the International Gemological Institute and including its own certificate, this captivating bracelet features a string of shimmering cultured freshwater pearls and a 9ct yellow gold clasp stone set with diamonds. Uniting vintage perfection with contemporary style, this gorgeous bracelet is the perfect finishing touch. 9ct yellow Gold Certified Cultured Freshwater Pearl Bracelet is rated 4.5 out of 5 by 2. Rated 4 out of 5 by Anonymous from Nice bracelet Nice bracelet although the clasp is difficult to close using one hand. I purchased this item online. When opening the parcel, and the box, I found the clasp was completely buckled and couldn’t be closed at all. I had to get a replacement in store. Rated 5 out of 5 by Anonymous from Beautiful bracelet We bought this pearl bracelet as a wedding gift for our daughter to wear on her wedding day. I am delighted with both the quality and appearance of this bracelet, it is a really good buy.